In the second post of my Solo Traveller Series – which showcases the journey of solo travellers, especially solo female travellers, from India and other parts of Asia – I’m excited to introduce Parvinder Chawla, a Mumbai local and wheelchair traveller who isn’t afraid to travel the world solo. This post shares the challenges and joys of wheelchair travel, highlights destinations friendly towards wheelchair travellers and offers travel advice for disabled travellers and travel inspiration for all solo travellers. Read the first post of this Solo Traveller Series here. It was pure serendipity that I landed up in Parvinder Chawla’s house on a rainy Mumbai night. When last minute plans took me to the city, I searched desperately for any available Airbnb in Bandra and booked the spare room in Parvinder’s house – not knowing that I was going to stumble upon her incredibly courageous story. Her baby face, her infectious laugh and her warm welcome put me at ease immediately. She too, loves travelling, seeking out new cultures, putting herself out of her comfort zone, trusting in the kindness of strangers halfway across the world. There’s one difference though – she’s on a wheelchair and her body movement is restricted. Parvinder on the countryside of England. Even around her own house, I noticed that she could only walk a few steps before having to sit or lie down – this acute sense of tiredness in her limbs makes her use a wheelchair most of the time. She had to muster up the energy to chat with me late into the night, and the bed and toilet seat were positioned unusually high to make it easier for her to get on and off easily. It’s hard enough for us, average travellers, to find the courage to travel alone. So as I sat there, hearing about her adventures – paragliding in Taiwan, travelling alone in China, zip-lining in Ecuador – I could only imagine the courage it must take her to board a flight, wheelchair in tow, to an unknown part of the world, confident of having a good time all by herself. In her thirties and beyond, she’s explored 18 countries across 6 continents – many of them solo. And when I reached out to her for this story, she was setting off on her most challenging journey yet – a month-long solo backpacking trip across Europe, with no fixed plans and no pre-booked accommodations! Parvinder (Pammu) recalls her childhood and early teen years as happy, bubbly, and exciting. She was an active kid and loved the outdoors – skating and swimming; playing hockey, cricket and badminton; going for picnics and hikes. At age fifteen though, she started to develop rheumatoid arthritis and experience pain in her arms and knees. By age twenty-one, the pain had worsened and she had to use a wheelchair to move around. She recalls being very ill by the time she finished college; she couldn’t move her limbs at all. Perhaps it was sheer willpower that got her through this difficult time, perhaps the unfulfilled passion of travelling and living life on her own terms. 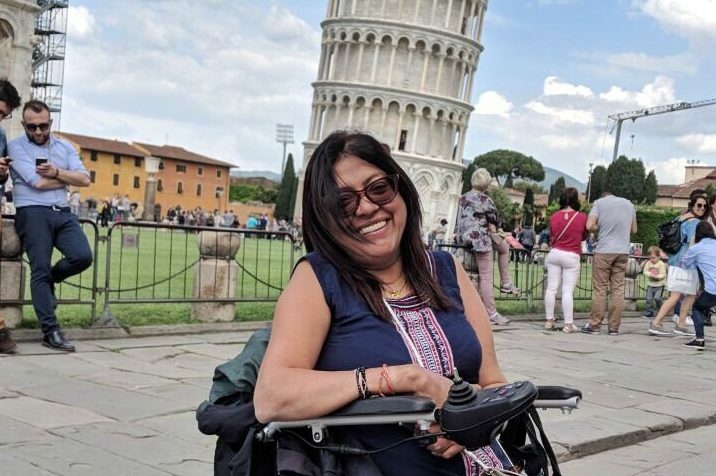 In her late twenties, in a situation where most people would give up and surrender to living miserably, Parvinder began to dream of travelling the world – despite being confined to her (then manual) wheelchair. Her friends invited her to join them on a trip to Jammu and Kashmir, and along with a helper, off she went – her second time away from Punjab and Mumbai, her two homes (the first time was to London, when she went to meet someone she had gotten to know on jeevansathi.com; he turned to be a fraud, but that’s a story you have to wait for her to blog about!). She was immediately bitten by the travel bug and impulsively decided to book a trip to Mauritius with a tour company – alone, yet part of a group with other travellers. She then travelled to Malaysia with a single friend, gradually building the confidence to travel by herself. Her first solo trip happened on impulse – when she decided to fly to Bali from Malaysia, all alone! She recalls staying in a basic hotel, taking a one-day tour of Bali, then exploring alone on her wheelchair – asking kind strangers to help her off the chair or up steps. Like many of us, Parvinder initially thought she’d love to travel with her family and friends. But with time, she got tired of waiting for someone else’s company – and figured out she was happier travelling on her own. Her (now automatic) wheelchair gives her the flexibility of “walking” long distances without feeling tired; it’s easier to make plans on her own time; she always finds kind people when she needs help; and ends up meeting and talking to more people when she’s alone. In China for instance, Parvinder says she was rather surprised to discover that much like India, trains, buses and metros were not geared towards wheelchair passengers. Often when she asked passers-by to help give her a push up a steep ramp, they declined – possibly because they didn’t understand what she was saying. That changed on a disappointing afternoon outside the metro station, when she was having no luck figuring out how to get to her train. A lady – headed hurriedly in the opposite direction – luckily understood some English and helped Parvinder, not only to the entrance on the other side of the street, but until they met the metro staff so she could explain where Parvinder needed to go! Besides support from her family, Parvinder’s dabbled in several projects to fund her travels: from working in a call centre to fund her trip to Mauritius, to babysitting, to running a catering service. Her Airbnb in Mumbai is also a steady source of income – and travel inspiration! Her family initially worried about her safety and expenses while undertaking trips by herself. But as time went by and they began to see how happy she was following her dreams, they set aside their worries and started to cheer her on. They also chipped in by contacting friends and distant relatives in places she travelled to, so she could feel at home right away. Her cousin aptly nicknamed her “globetrotter”. For an average traveller, it’s easy to stay in a hostel, hotel or Airbnb, run after a bus, squeeze into an elevator, make lunch plans with a fellow traveller or take a local tour. But she has so many other things to consider – the height of the bed, whether the washroom door is wide enough for a wheelchair, if an attraction can be accessed with a ramp, if a bus driver will help her on board, for instance. That doesn’t deter her though; she finds ways and tools for whatever she needs to make her day-to-day goals easier, and with time, she’s become better at travel planning. She says she also draws strength from chanting and spirituality. Many countries around the world – like Australia, Dubai and the US – are wheelchair-friendly and that makes life easier. But in India – where travel infrastructure, public toilets, wheelchair access and safety are all major concerns for travellers with special needs – she prefers to travel with a friend, and usually contacts her accommodation in advance to find a local to help her along the way. I receive messages every day from fellow dreamers who want to travel solo but are too afraid to take the plunge. Too scared, too unsure, too bogged down by what-ifs. When I shared that with Parvinder, she quickly dismissed these thoughts, as though fear didn’t exist in her dictionary. On the metro in Australia – which Parvinder has found to be one of the world’s most wheelchair-friendly countries – she met another woman on a wheelchair, a local who confessed she only ever did the route to her aunt’s house and back, and who was really surprised (and inspired) by Parvinder’s journey. The two have kept in touch, and who knows, might even meet again somewhere in the world one day. Visiting her grandparents in Rajasthan. Parvinder believes that travelling has made her a more confident person – transforming her from being so ill that she couldn’t move her limbs to mustering up the courage to go wheelchair-backpacking across Europe alone. She is content being single and appreciates the freedom to spend money on things that make her happy. Her mantra is to enjoy life, no matter the odds, and she feels lucky to have met warm, helpful and friendly people around the world. We’ll all die one day, she says casually, so why take so much stress? Shoutout: Join Parvinder to help tell her stories on her new travel blog. As you can tell, Parvinder has a wealth of stories from around the world that she’s keen to share through her new blog – Wheelchair and Eye. She is looking for a creative person to work with her, to help turn her travel experiences into inspiring travel stories. If you’re interested, please write to Parvinder with your motivation and ideas at dipsandmore.in@gmail.com. Read more about Parvinder’s journey on The Huffington Post, Holiday IQ and The News Minute. What’s your biggest solo travel challenge? How do you overcome it? If you’ve met inspiring solo travellers from India / Asia who I could consider featuring in this series, please connect us! Thanks to Parvinder Chawla and Remya Padmadas for their inputs. ” You will die one day, so why take so much stress? There’s so much to see, so much to experience. Just go out there and do it.”- Thank you Parvinder for these lines. More power to you. Fantastic story! Thank you for introducing all of us readers to Parvinder! Thanks for reading! I’m so glad I decided to start this series! Wow…Thanks for sharing this story Shivya. What an inspiration !Parvinder shows the real traveller spirit, the one of adventure, taking the challenges and uncertainty head on and then having a few tales to tell !!! More power to her ! I totally agree Harjot. Meeting her put so many things in perspective for me. I agree; so glad I landed up at her place! Wow! so happy to have met Parvinder through your blog. Following her blog right away. And such a coincidence for you to have landed up in her house. That’s great Deepa! It was a brilliant co-incidence indeed, and I hope there will be many more. Loved sharing her story, which personally inspired me greatly too. What an inspiring woman ! Thanks for sharing her story !! Indeed she is. Thanks for reading, M! What an inspiring story! Hats off to Parvinder. Wow! this is really inspiring. Shivya, I really appreciate the way you feature solo female travelers and hence inspire and motivate rest of us. Hats off!! Wowww… Very inspiring. Thanks for such inspiring travel stories, Shivya. We should always travel theroadlesstravelled.in the world. Amazing! Thanks for sharing. Would love it if you can check out my blog! Motivational and an inspiring story. Hi Shivya…I happen to live near Mumbai…and as you have mentioned in the post, Parvinder is in search for a creative person to transform her experiences into stories. I am passionate about writing, especially there are stories waiting to told to the world. I would love to work for her and learn from her. Please help me connect with her (tried following her blog but it is private and my request is still pending, sent across a mail but haven’t heard from her yet). Awesome , You truly are inspiration for many and we are always here to support for anything we can do . Previous PostFun and Alternative Things to do in Copenhagen – Perhaps Europe’s Coolest Capital City. Next PostThis World Environment Day, 5 Steps to Reduce Single Use Plastic – On Our Travels and In Everyday Life.